I started reading The Hunger Games, by Suzanne Collins, while ensconced in an overstuffed armchair at the mall bookstore, killing time before the next showing of Mission Impossible IV. I rarely read popular literature of that kind. I picked it up on a whim, and I fully expected to dislike it. By the time I finally had to set the book down, I was about a hundred pages into the story–yes, there was a lot of time to kill before the next movie showing–and, to my surprise, I was hooked. I had to get a hold of a copy and finish it. The setting of The Hunger Games is a dystopian future in the country of Panem which is divided into twelve districts ruled by a central, and dictatorial, Capitol. In former days, the twelve districts staged a failed rebellion against the Capitol, and in punishment for this crime, the Capitol now demands a yearly tribute from each of the districts: one boy and one girl between the ages of 12 and 18. The tributes, chosen by lottery at the annual “reaping”, are brought to the Capitol where they must compete in a televised contest known as The Hunger Games. There the 24 teenagers must use their wits, their strength, and their survival skills to eliminate all competitors and fight to the death while the whole country watches. Only one of the tributes will survive, and in this way the Capitol will inspire fear and obedience amongst its subjects. Katniss Everdeen, a resourceful sixteen-year-old from the poverty-ridden District 12, is the sole breadwinner for her widowed mother and younger sister Primrose. Nearly every day she sneaks into the woods to hunt food for her family, a forbidden activity, and earns money for necessities by surreptitiously selling game to others in the district. Her best friend Gale, an eighteen-year-old boy, supports his family in the same way, and the two often hunt together. When the reaping for The Hunger Games comes around, Katniss’ chief fear is that she or Gale will be chosen–and who will provide for their families then? But when the lottery winners are announced, something even worse occurs: Primrose Everdeen, her sweet and simple little sister, has been chosen as the female tribute. Katniss immediately volunteers to go in Primrose’s stead, an uncommon gesture but acceptable according to the rules. Before she knows it, she–along with the baker’s son, Peeta Mellark–are being transported to the Capitol to prepare for the most gruesome contest of their lives…. 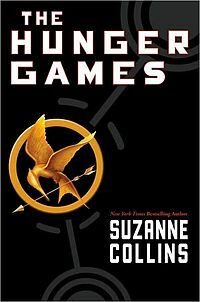 It is difficult to analyze The Hunger Games without spoiling the story for those who haven’t read it. I will say that author Suzanne Collins is especially adept at world building and creating believable characters. From the very first pages, the first person narration allows you to visualize Katniss’ home and empathize with her struggles. The plot is well paced and without a dull moment, although I did find the end of the book to be less compelling than the rest of it. Some have compared the grim, dystopian setting of the book to Orwell’s 1984, but I was reminded more of similarities to ancient world stories: Theseus and his companions being sent as tribute to Crete to face the Minotaur, Rome’s captives forced to fight each other as gladiators in the arena. The storyline is laced with a familiar ethical dilemma: should Katniss kill the other contestants if it is the only way for her to survive, or should she choose the role of martyr over murderer? But although the dilemma is presented, Suzanne Collins does not press it too far. Katniss is protected from ever really making that decision by the circumstances of the plot, and even at the ending of the contest I did not feel that the question had been given an honest answer. The final chapter of The Hunger Games gives some closure to the story, but the way is definitely left open for the further adventures of Katniss Everdeen in Catching Fire and Mockingjay. I’m looking forward to reading the sequels and can only hope that they are as well-told the first volume of Suzanne Collins’ trilogy.